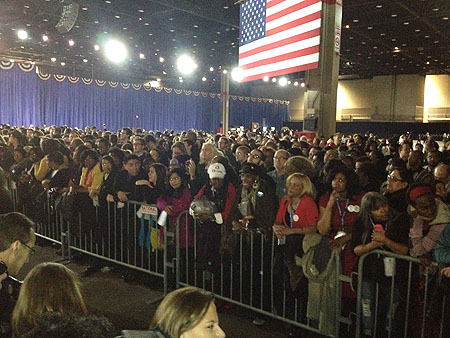 Thousands of people gathered in McCormick Place anxiously awaiting the results of the presidential election Tuesday night. Among the list of high profile politicians and celebrities, were campaigners. The everyday people who volunteered their time to ensure the re-election of President Obama. Understanding that Wisconsin would be a key state in helping him win re-election, supporters went door to door Nov. 3-5 to help increase voter turnout. For doing this, Obama offered supporters an opportunity to a ticket to his Election night watch party in McCormick Place. Finkenbinder said it was important to make sure the volunteers had the resources they needed to talk to their neighbors and their friends about the election. William Ocasio went out to campaign for President Obama because he believes Obama will look out for the middle class. Raw video: The crowd gets pumped as results come in. Ocasio was able to attend the election night watch party because of his help canvasing Iowa and Wisconsin—two of the battle ground states. The key factor in the president’s re-election was his ability to pull swing states including, New Hampshire, Pennsylvania, Wisconsin, Iowa, Virginia and Nevada. The audience erupted after it was announced that President Obama had been re-elected for a second term in office. People in the crowd cheered, danced, hugged, and shed tears of joy. 2nd District: Jackson Jr. wins big, will he serve?